These days, keeping things green and eco friendly is more important than ever. That’s why, when you’re building a deck, you should always take composite decking into consideration. Composite decking is the combination of recycled wood chips and plastic. They have many different styles and come in various Earth tones, so you can always match the wood with your furniture or home. At first glance, you may see no difference between composite decking and other materials. Read on to see why composite decking is absolutely worth your time. As mentioned, one of the biggest benefit is being environmentally friendly while also presenting as many style options as possible. They use recycled material, so you won’t have to worry about hurting the environment. But, most of all, composite decking is extremely low maintenance. Where you might have to continually upkeep other materials, composite decking requires only a little TLC now and then. A quick scrub in the spring with dish soap and a sponge is all you really need, which eliminates the use of harsh chemicals entirely. With everything, there comes a downside. Composite decking can’t be refinished, so any scratches and damages may be permanent. This isn’t always a downside for many people, though. It adds character, and minor cosmetic damages don’t risk the entire structure. However, composite decking is a little more expensive than most. If you can afford it, always go with the greener option; it’s going to save you money in the end, through maintenance costs and replacement costs. Composite decking will take longer and doesn’t need to be refinished. Not everyone has the time to maintain a regular wooden deck. If you are ready to be more environmentally friendly while saving your time and energy, a composite deck is right for you. One more major issue with composite decking is that it tends to fade. Though, recently, coatings and sealants are being released that could potentially solve this problem should it happen to you. 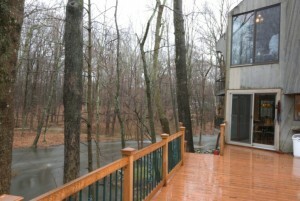 Mid-Atlantic Deck & Fence wants to set up your composite deck today!